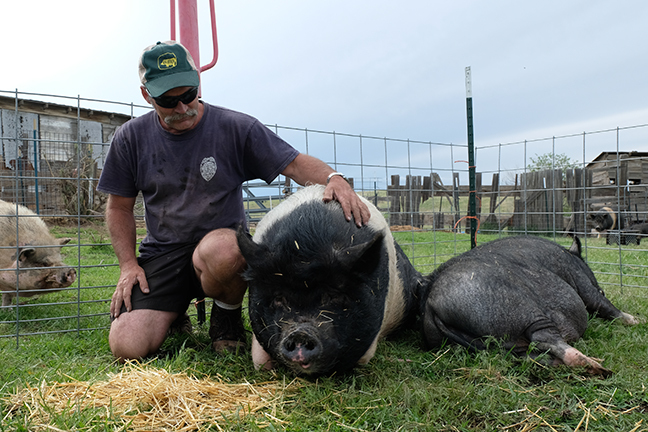 Life at Hog Haven Farm has been an adjustment for these two, but we shower them with love every day. Dottie has a difficult time walking, but we’re so pleased that she’s made progress over the last two weeks; instead of staying in the barn 24/7, Dottie has been venturing out to sit in the mudhole and is now eating her meals outside with her pen mates! In June, Hog Haven Farm welcomed Raspusha “Razzy” (11yrs) and Marvin (4yrs). Razzy suffers from potential nerve damage, and has a difficult time walking. She is also missing both of her ears from a dog attack earlier in her life. 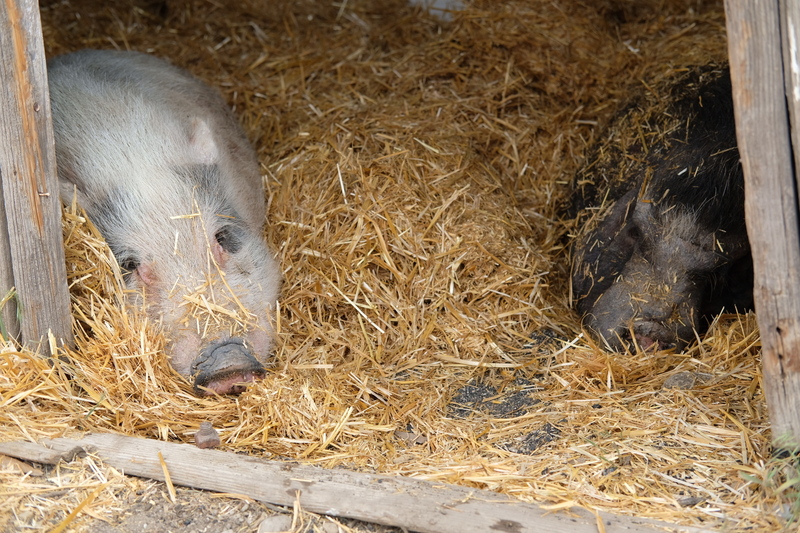 Both Razzy and Marvin are very sweet pigs, and though they are slightly timid, they welcome affection. Our goal with all of these new pigs is to keep them as comfortable and happy as we can, and giving them extra love and belly rubs to ease their transitions. 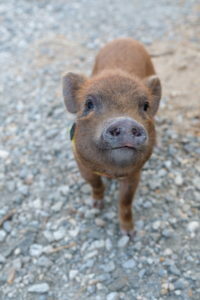 Our latest new addition is Sweet Dee, a 5mo old piglet who lives up to her name! Dee gets to be pampered inside of our home, as she recently had her spay surgery and needs to heal completely before meeting any of the other piggies. She is playful, funny, and already a pro at walking on a leash! Hog Haven Farm has also had a few successful adoptions to kick off the summer; Oscar and Tippy headed to their forever home, as did Alvin, Kevin and Boots! Two of our piglets will be headed out this month, as will Penelope and Pepper! We just love happy endings, and are so happy these piggies found their forever families. Next > Is pig adoption right for you?